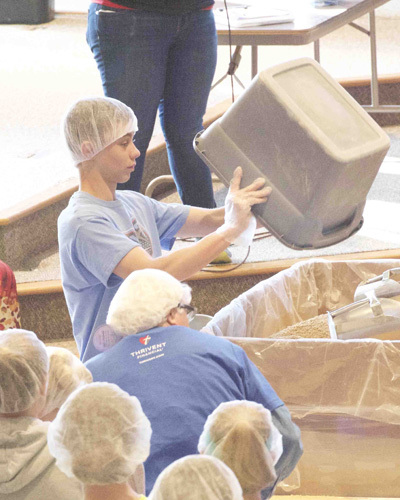 Itâ€™s a touching moment, and one I experienced last weekend while filling food bags at the Feed My Starving Children mobile site hosted at our church, Hosanna Lutheran. 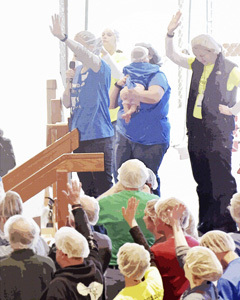 An army of volunteersâ€“877 strongâ€“donned hairnets and fearlessly went to work despite looking like human cloud-heads. 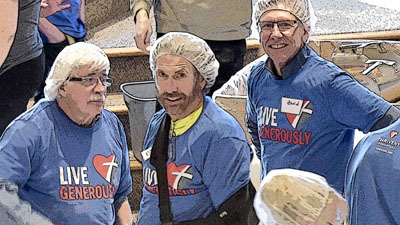 There was loud, upbeat, Christian music on the speakers, yellow T-shirted leaders keeping the errant in line, and a feeling of pure loving energy. 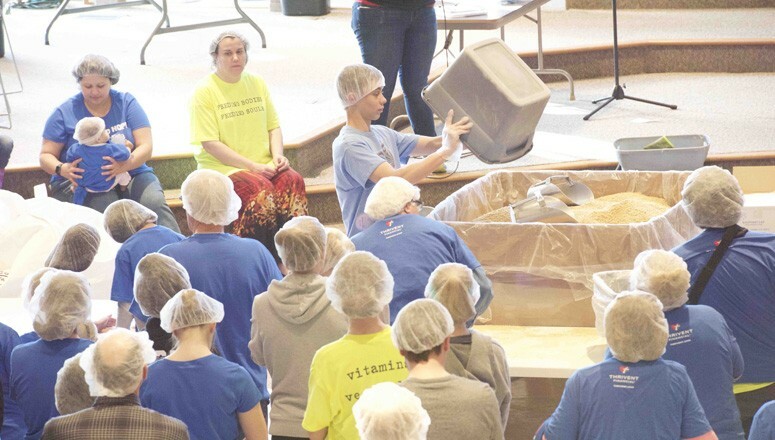 The quest was in front of us: bag and pack 150,000 meals for children facing hunger around the world and… we felt like it was entirely possible. Huge containers of rice, soy, powdered vitamins, and dehydrated vegetables sat around the room like mini-mountains that needed conquering. Tables, neatly organized, held funnels, scales, bags, and heat sealers. It was choreographed chaos at its best. My husband and I had signed up for the last two-hour stint, and we were ready to serve. Friends of oursâ€”Doug and Sharon Sillâ€”asked if we would join their team as a couple of â€œTeam Sillâ€ members were unable to attend. â€œSure!â€ we said in unison. Before bagging, we were shown two videos. One talked about starving children and how the bagged food was saving lives. The other video listed basic instructions on how to place the ingredients and hygienically handle the bags from placing under the funnel to sealing. Maybe we were on the remedial â€œspecial needsâ€ team, but we struggled. Placing the bag under the tube looked so easy on the video, but that was not the case as we fumbled along. The order of food placement was to be: one packed scoop of vitamins, one scoop of dehydrated veggies, one cup of soy, and one cup of rice. The rice was the equalizer. If the bag weighed too much, take out some rice. If the bag was too light, add some rice. Simple, right? Not so much. My husband kept tossing the soy in the bag as soon as it went under the funnel. Then the other two gentlemen would look at each other with faces that said, Did we put our stuff in yet? Confusion ensued. The brave woman doing the bagging said, â€œIt should be vitamins, veggies, soy, rice. One, two, three, four!â€ The men would nod and then do exactly what they had been doing before. I was the rice lady. Significant responsibility! No matter how hard I tried to be consistent with my cup of rice, more often than not they had to adjust for weight. Argh! I kept thinking we were wasting time that could be spent making more and more and more bags. There were starving children counting on us! As I pondered this, my husband would toss in another cup of soy, and weâ€™d be messed up again. The time flew, and we were told our goal had been reached. It was time to stop. As we helped disassemble and clean the area, I felt good knowing I had contributed a teeny tiny bit to addressing the world hunger crisis. At first, I was thrilled that we had exceeded the goal in every area. But then I sobered. Only 468 children fed for a year? That Schindler feeling came over me. We have to do more! We can do more! After giving the results, Pastor Friesen announced Hosanna has already contracted to be a Feed My Starving Children mobile pack location in April 2017. The fundraising is to start immediately. As I drove home with a trunk full of groceries, I felt stabs of guilt. I usually have these occur after church, but on this day they were bigger. Louder. My life has been blessed in countless ways. How can I save the world? One life at a time? Letâ€™s do this. Beautiful, Gail…Yes, we can do our part…It was so wonderful to be a part of this!. Thank you for sharing! What a great story! You did your part and every child who eats well from those little bags will smile. I sure hope so, Lynne. The video showed a 2 year-old in Haiti that weighed 9 pounds when they found him. He’s doing pretty good with the meals, and he was smiling.